the potential space between the parietal and visceral layers of the pleura. the space within the thorax that contains the lungs. Between the ribs and the lungs are the visceral and parietal pleurae. a coelomic cavity surrounding the lungs of mammals that is separated from the rest of the perivisceral coelom by the DIAPHRAGM. 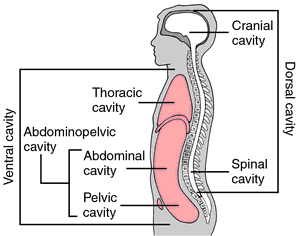 The cavity is fluid-filled and small, as the lungs and body wall are in close proximity to each other. Regarding chest drainage complications, the following was obtained: 5% (5/100) of subcutaneous emphysema--due to the drain being located in the subcutaneous cell tissue; one case (1%) of infection around the drain; five cases (5%) of accidental dislodgement of the tube, requiring re-drainage, and in 5% (5/100) of the patients there were some complications when removing the drain, with small pneumothoraces due to the presence of air in the pleural cavity at the time of the removal; however re-drainage was not required. At emergency midline laparotomy, 15 cm of herniated perforated necrotic small bowel was removed from the right pleural cavity and resected, and the bowel was anastomosed. The elephant's respiratory system is quite exceptional as it lacks a pleural cavity and lungs are directly attached to the walls of the chest cavity. The distal tip of the VP shunt may migrate proximally along the chest wall, and may end up either in the pleural cavity or the lung parenchyma, with a few cases of bronchial perforation also being reported. IV injection of hydrocarbons can result in pulmonary toxicity (5) injection of petroleum in to pleural cavity may result in chest wall necrosis and empyema (6). Non-Hodgkin's lymphoma of the pleural cavity developing from longstanding pyothorax. As a mechanism for pleural lymphoma, it had been suspected that there was chronic stimulation of B-cells in the pleural cavity such as that in long-standing chronic pleural disease, because it was reported that the most common malignant lymphoma arising in the pleura was B-cell non-Hodgkin's lymphoma of the diffuse large cell type histologically (1-7). In case a postoperative collection of pus developed in the pleural cavity, (empyema), a thoracoplasty was carried out, removing long lengths of ribs three to nine, in order to reduce the size of the residual chest cavity. A wide variety of causes--including heart failure, kidney disease, infection, cancer and traumatic injury to the airways--can result in a buildup of fluid within the pleural cavity, the pressure of which inhibits the lungs from expanding and contracting with ease. Despite the known association between asbestos exposure and pleural responses, questions still remain on the fundamental process of translocation of fibers to the pleural cavity.